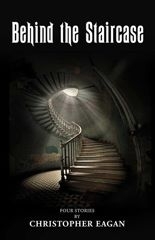 This new book by author Christopher Eagan includes 4 stories in the science fiction, horror, fantasy style effectively creating a book titled, "Behind the Staircase," which can be enjoyed with the same enthusiasm as if narrated by a playwright. Las Vegas, NV, July 15, 2018 --(PR.com)-- The first story, “School Days Once Again” is the story of how powerful ancient demons possess the children of an upscale New York apartment building. One of the apartment building occupants, Jennifer who is a single working mother, leads the residents of the building to exorcise the demons before they burn their children alive. “Crescent Hills” is the second story in the book and it centers around an antique dollhouse that is the only link to centuries of sudden disappearances of entire families. Mary, a grief-stricken bartender, and Bill, a trusted police officer, who is one of Mary’s best customers, must find the source of the doll house’s power before it strikes again. The story brings to light the past of the dollhouse and where it gets its power. The third book in the series is about a couple, Rachel and Richard, who are stunned to find a mysterious image of a painter, who suddenly shows up in video footage of people whose lives are about to end. “The Soul Painter,” tells of how the lowly CIA techs’ obsession with this strange painter leads them to an ancient castle but, will finding the truth of the soul painter’s powers be too much for them to bear? The final story is “I Got Your Number.” Markus’s vacation is taken over by a mystifying woman who begins to appear in his dreams. Convinced she is the love of his life he is determined to save her from the perils facing her. Markus’s desire leads him on a surreal journey that challenges all perceptions of space, time and reality to find what he is looking for or be lost forever. The author, Christopher Eagan is from Las Vegas, Nevada and at a very young age, Chris was able to see in his imagination things yet to be invented. He could see how things were constructed, with very little thought. He knew he wanted to be an inventor at an early age and at the age of 25 he created approximately 20 diagnostic tools that sold worldwide. At the age of 56, Chris was sitting in his house, and his creativity started to kick in again, and ideas of stories started to unfold. Chris talked to his wife about it, and she said she would start typing while the storylines came to him. With his wife by his side typing, Chris found he could roll with the stories and not worry about what he would be typing on the computer; he had an uninterrupted thought process. “Being a Twilight Zone fan and enjoying Sci-fi, the stories unfolded like movies in my mind, and that’s when I wrote the stories,” Chris said. This new book will be made available worldwide in all major online bookstores, and be found in both eBook and paperback form on Amazon.com. “Four supernatural, paranormal thrillers,” Diane said. “I’ve read the first two stories, and they are fabulous,” Denise commented. James Paul Publishing (Books) was founded by James Bruce in 2015 located in Grove City, Ohio. The book group has publishing connections worldwide. James Paul Publishing publishes new books and short stories in hard copy, paperback and digitally. Although James Paul Publishing will concentrate on children’s fictional, fictional and non-fictional books we will help authors with self-publishing. Today, James Paul Publishing and their authors are at the center of everything they do. James Paul Publishing is proud to provide their authors with unprecedented editorial excellence, marketing reach, connections with booksellers, and industry-leading insight into reader and consumer behavior. Consistently at the forefront of innovation and technological advancement, James Paul Publishing also uses digital technology to create unique reading experiences and expand the reach of our authors.